Cell differentiation degree and mitotic activity were sequentially assessed by immunoperoxidase labeling of glial fibrillary acidic protein (GFAP) and proliferative cell nuclear antigen (PCNA), respectively, in rat brain cultured astrocytes maintained up to 60 days in vitro (DIV) of first subculture, or weekly passaged until their 12th subculture. Cell count was performed through a 0.01 mm2 section reticule and morphometric analysis with a stereological grid. The number of double immunoreactive cells peaked by 2 DIV to achieve its lowest value at 60 DIV. At 24 hs of cell seeding of successive passages, such values peaked by the 6th subculture to gradually decrease thereafter. Increasing cell hypertrophy was found during the long-term first subculture but not after passaging. At the end of the observation period, doubly immunolabeled astrocytes were still recorded, thus evidencing retention of proliferative potential despite aging. Key words: Astrocyte; Cell culture; Immunoperoxidase labeling; GFAP; PCNA; Quantitative analysis. El grado de diferenciación celular y la actividad mitótica fueron secuencialmente determinados mediante marcación por inmunoperoxidasa de la proteína gliofibrilar ácida (GFAP) y del antígeno nuclear de proliferación celular (PCNA), respectivamente, en cultivos astrocitarios obtenidos de encéfalo de rata y mantenidos hasta 60 días in vitro (DIV) de su primer subcultivo, o mediante pasajes semanales hasta el 12do subcultivo. El conteo celular se realizó mediante una retícula de 0.01-mm2 de sección y el análisis morfométrico con una grilla estereológica. El número de células doblemente inmunorreactivas alcanzó valores máximos a los 2 DIV para descender a los menores a los 60 DIV. A las 24 hs de sembrado celular de los sucesivos pasajes, esos valores ascendieron hacia el 6to subcultivo para luego declinar. En cuanto a la hipertrofia celular, se observó en todo el curso del primer subcultivo, pero no durante los posteriores pasajes. Al final del período de observación, todavía se continuaban detectando astrocitos doblemente inmunomarcados, los que en consecuencia evidenciaban retención del potencial proliferativo pese al envejecimiento celular. Palabras clave: Astrosito; Cultivo celular; Marcación por inmunoperoxidasa; GFAP; PCNA; Análisis cuantitativo. Astrogliosis, as evidenced by cell hypertrophy and signs of metabolic activation, is a predominant change that occurs in glia during aging1. Such age-related astrogliosis, as that observed as early CNS response to trauma, disease, genetic disorders or chemical insult, is characterized by increased synthesis of glial fibrillary acidic protein (GFAP), the principal 8-9 nm intermediate filament in mature astrocytes2. Since greater GFAP immunochemical expression is commonly accepted to reflect increases not only in size but also in the number of reactive cells, the possibility of raised proliferative ability in senescent astrocytes deserves further research. Notwithstanding the limitations of the in vivo model as a valid counterpart of CNS events in the whole organism, it is recognized that cell culture allows a simplified and controlled study of changes in morphology, immunophe-notype and mitotic ability of astrocytes reacting to aging3 or injury4. Taking into account that expression of the proliferative cell nuclear antigen (PCNA) has proven to be a significant marker of mitotic activity in cultured as-trocytes of confirmed identification by GFAP staining5-7, here we carried out sequential GFAP immunolabeling (brownish cytoplasm) and PCNA (reddish nuclei) for simultaneous visualization of differentiation signs and cell proliferation in aged astrocytes. To this end, long-term first subculture of brain astrocytes from newborn rats, as well as weekly passages started from first subculture at 7 DIV, were employed as experimental models of aging. In selected harvested samples, the number of immuno-reactive cells was recorded, the ratio of co-labeled astrocytes estimated, and changes in cell shape evaluated by quantitation of the GFAP-immunoreactive profile. On the basis of a previous description8, dissociated cells obtained by trypsinization of the primary astroglial culture were seeded on glass coverslides of Leighton tubes at a concentration of 300,000 cells/ml. Samples serially harvested at 1, 2, 9, 15, 20, 30, 45 and 60 DIV of such first subculture or else corresponding to 24 h of cell seeding of 2nd, 4th, 6th, 8th, 10th and 12th weekly passages, were fixed with chilled methanol plus 5% acetic acid for 15 min. To determine PCNA/GFAP labeling index, a double immunoperoxidase staining for GFAP and PCNA was carried out. Samples previously treated with 1/20 dilution of normal goat serum for 30 min, were then incubated overnight at 4C with polyclonal anti-GFAP (Dako, Denmark, diluted 1/1600), followed by biotinylated goat anti-rabbit (Dako, diluted 1/200) and peroxidase-conjugated streptavidin. (Dako, diluted 1/200), applied successively at room temperature for 30 min each. The reaction was developed in freshly prepared DAB (Fluka, USA, diluted 0.03% in Tris buffer containing 0.02% of H2O2). Following GFAP labeling, residual peroxidase was blocked by incubation in 1/20 dilution of normal goat serum for 30 min. Such samples were then incubated overnight at 4C with monoclonal anti-PCNA (BioGenex, USA, diluted 1/800), followed by biotinylated rabbit anti-mouse (Dako, diluted 1/200) and peroxidase-conjugated strepatavidin diluted 1/200. The reaction was developed in AEC Chromogen Kit (Ultratech, France). In samples only labeled for GFAP, light counterstaining with Mayer´s hematoxylin was performed to count nuclei present in the cell monolayer. Separate positive controls were provided by either GFAP or PCNA staining. Percentage of PCNA labeling in 250 GFAP(+) cells for each sample was recorded in microscopic fields delimited by a 0.01-mm2 section reticule. Resorting to a computer-assisted system, quantitative evaluation of immunoreactive cell bodies and processes was carried out using a stereological grid and the point-counting method of Weibel9 as applied to rat brain tissue10. Accordingly, the ratio of the GFAP immunoreactive surface to the volume of a given structure was calculated by the formula Sv (surface density) = 2 I/L , where I is the number of points at which the immunoreactive profile crosses the test gride lines and L is the test line length. To this end, 16 doubly labeled astrocytes in each sample were randomly chosen for measurement of SvGFAP by selecting isolated cells sharply demarcated from the negative background. Counting of doubly labeled cells, as well as evaluation of SvGFAP, were carried out by at least two independent observers. All data were analyzed using Student¨s t-test for comparison of the means, taking p<0.05 as significance level. The count of GFAP(+) astrocytes also exhibiting PCNA(+) labeling in the course of long-term first subculture (Fig. 1-A) peaked at 2 DIV (74.8%), dropped significantly by 9 DIV (41.2%), declining to minimal values (10.0%) at the end of the 60-DIV observation period, even though a statistically significant increase was recorded at 45 DIV (39.2%). 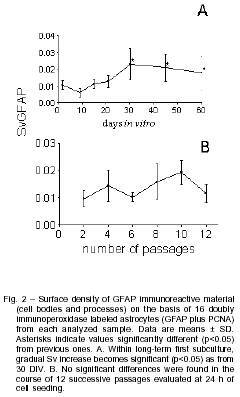 In turn, within 24 h of cell seeding for each weekly passage (Fig. 1-B), initially recorded values of double immunolabeled cells (19.2% from the 2nd subculture) peaked to level off at roughly 50% as from the 4th up to the 10th day, to drop significantly (22.4%) at the end of the observation period (12th passage). As analyzed by staining of cell bodies and processes, SvGFAP was found to increase gradually in doubly labeled cells from the long-term first subculture, starting from 0.0104 ± 0.0030 at 2 DIV and reaching 0.0180 ± 0.0300 at the end of the 60-DIV observation period (Fig. 2-A). In contrast, no significant changes in SvGFAP were recorded in the course of successive passages (Fig.2-B). Although at 45 DIV there was an unexpected increase in the number of formerly quiescent GFAP(+) astrocytes re-entering the division stage, which led to repeated counts to confirm such finding, the lowest values in the percentage of doubly labeled cells were recorded at the end of the observation period. The fact that percentages were calculated on the basis of 250 GFAP(+) cells per analyzed sample, afforded an advantage over our initial approach resorting to immunoreactive cell count in a given number of randomly chosen microscopic fields, which implied poorer sample representativity due to occasional peripheral deattachment of the aging cell monolayer. In the course of successive passages, peak detection of proliferating astrocytes during the 6th subculture was roughly in agreement with reported transient increase of growth rate11, but as from the 10th passage, we documented a progressive drop in the percentage of doubly labeled cells, thus implying a reduction in proliferative potential during aging. As regards the SvGFAP evaluated by Weibel method9, such approach allowed us to determine immunoreactive profiles for cultured astrocytes that, besides exhibiting GFAP(+) in cell bodies and processes, also showed PCNA staining in nuclei. Resorting to this sequential immuno-labeling, we were able to document that there was marked astrocyte hypertrophy increasing with DIV, in contrast with milder SvGFAP changes at each passage. Since successive subcultures for morphometric evaluation were harvested 24 h after seeding, it was not unexpected to find lower GFAP(+) profile values than in long-term first subculture. Due to stimulated cell division by passaging, such newly generated astrocytes mainly exhibited flat polygonal rather than process-bearing morphology. Therefore, long-term astroglial cell monolayers seem to mimic more faithfully the physiological and/or pathological changes known to take place in the whole organism. Although age-related GFAP accumulation in the course of aging long-term culture appears as mainly due to cell hypertrophy rather than hyperplasia, up to 10% of cells displayed GFAP/PCNA double staining at 60 DIV. This detection of mitotic activity in all samples of long-term cultures throughout the observation period, confirms that even after achieving a non-dividing state, cultured astrocytes exhibit the described flexible capacity to re-enter the cell division cycle12, like their in vivo counterparts against neurotrauma13. Even in non-injured brain, the quiescent stage would be able to reverse during normal aging1 and neurologic disorders14. Such cell proliferation of chronically activated astrocytes may well imply a compensatory mechanism to neuronal death and dys-function, provided that glial scarring be elicited. Therefore, the use of long-term cultured astrocytes may represent a useful tool to support experimental procedures intended to speed up, slow down or arrest a cell reaction which, in the whole organism, may behave as beneficial or detrimental, depending on the timing. Since double immunolabeling as described herein proved effective to disclose both differentiation level and mitotic activity in one and the same cultured astrocyte, we are currently resorting to the same approach in brain tissue harvested from aging rats. 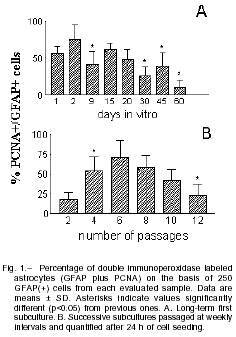 According to in vivo preliminary results, the greater the accumulation of GFAP immunoreactive material, the lower the percentage of activated astrocytes showing PCNA(+) staining15. Therefore, sequential GFAP/PCNA labeling for histometric analysis of activated cells still capable of expressing an intrinsic marker of DNA replication, as employed herein, is liable to contribute to discriminate between beneficial and deletereous effects of astrocyte response to aging.